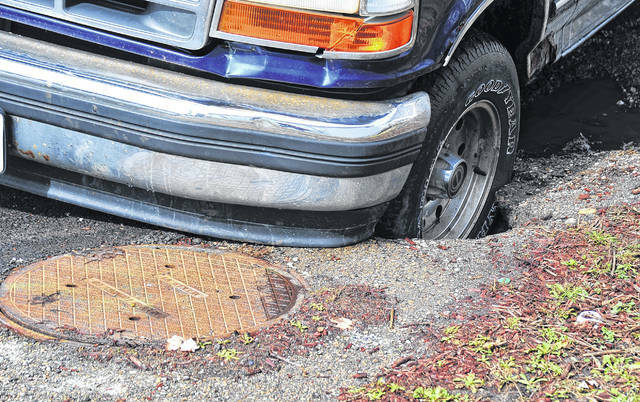 Mike Ullery | Daily Call file photo A sinkhole on Commercial Street formed on Feb. 22 when a storm sewer collapsed. That portion of the roadway has been closed since then. Mike Ullery Daily Call file photo A sinkhole on Commercial Street formed on Feb. 22 when a storm sewer collapsed. That portion of the roadway has been closed since then. 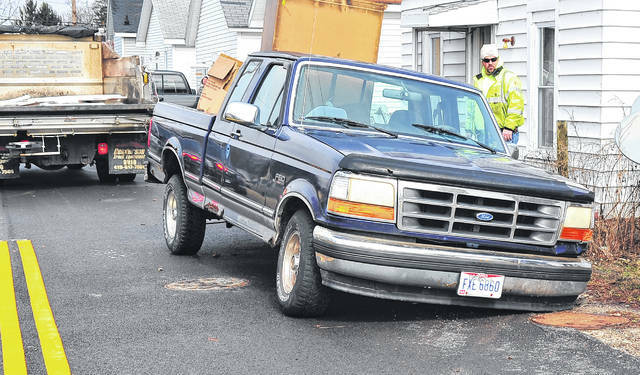 PIQUA — A portion of Commercial Street will be seeing over 3,000 feet of new water and sewer lines, stemming from an unexpected issue when a sinkhole formed in that area back in February. With the cause of that sinkhole being due to the condition of an underlying storm sewer, the city is now investigating the conditions of utilities infrastructure before doing new projects. The Piqua City Commission approved the project during their meeting on Aug. 21, when they approved consent to award a contract to Milcon Concrete, Inc. for the construction of the Commercial Street Utilities project. The contract is not to exceed approximately $485,849, which includes a 10 percent contingency. Milcon Concrete, Inc. is expected to begin the Commercial Street utilities project in the middle of September, and the project will take approximately two and a half months. The project will be funded through the storm water, water, and wastewater department funds, with 73 percent coming from the storm water fund, 18 percent coming from the water fund, and 9 percent from the wastewater fund. That portion of the roadway on Commercial Street has been closed since that sinkhole formed. “Underground Utilities investigated and found that along that stretch in Commercial between Miami and Young, we also had a sanitary sewer that was in very poor condition,” Schelle said. “They continued investigating upstream and downstream and found that a significant portion of the storm sewer going to the south along Commercial along with the storm sewer between Roosevelt and Commercial, along Grant and Young, also needed to be replaced.” Schelle explained that there was significant erosion on the bottom of the pipe of that storm sewer. A small portion of the project will also be going over an area that the city had worked on previously last year for the Commercial Street Trail Corridor project, which consisted of connecting existing trail facilities to the existing street improvements through short segments of multi-use trails. It made adjustments to street corridors to designate the bike routes and pedestrian pathways. The city is not expecting the upcoming improvements to the water and sewer lines to impact the improvements that they have already completed in that overlapping area too much. That overlap, though, has prompted the city to survey the surrounding infrastructure, such as underlying water and sewer lines, whenever they are about to do a new project, like new roadwork. “We will go in and televise the lines and make sure they’re all in good shape,” City Manager Gary Huff said. One example is with the city’s second phase of this year’s street resurfacing program taking place in the Shawnee neighborhood. “We found a couple sections that need to be replaced,” Huff said. The city is expected to replace those water and sewer lines before finishing the road repair work. https://www.dailycall.com/wp-content/uploads/sites/30/2018/08/web1_MU2_1394.jpgMike Ullery | Daily Call file photo A sinkhole on Commercial Street formed on Feb. 22 when a storm sewer collapsed. That portion of the roadway has been closed since then. https://www.dailycall.com/wp-content/uploads/sites/30/2018/08/web1_MU2_1402.jpgMike Ullery Daily Call file photo A sinkhole on Commercial Street formed on Feb. 22 when a storm sewer collapsed. That portion of the roadway has been closed since then.